"My husband loves Tonkatsu and uses this sauce on more than just Tonkatsu. 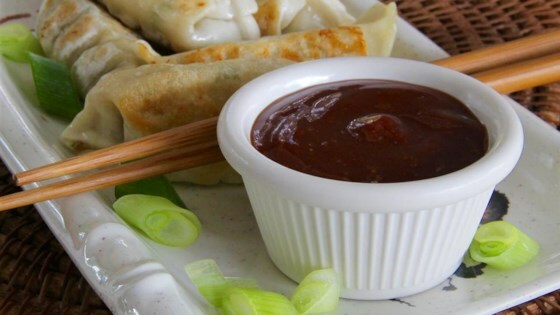 It's great for coconut shrimp and for dipping umeboshi pork rolls. Keep leftover sauce refrigerated . . . if there is any." Stir ketchup, soy sauce, brown sugar, mirin, Worcestershire sauce, ginger, and garlic together in a bowl. Let flavors blend for at least 1/2 hour. See how to make a dark and delicious fruit sauce for roasted meats and poultry. This is ready in half an hour, but is even better if you let it sit in the refrigerator for a full day. Very good flavor, seem authentic to me! Yummy! Just like what I get at Hawaiian Grill! This sauce was amazing with my katsu chicken! Might be my bf's favorite condiment!